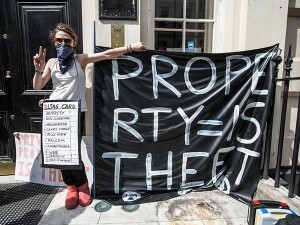 Resistance to s.144 of the Legal Aid, Sentencing and Punishment of Offenders Act (LASPO) 2012 that outlaws squatting in residential buildings is growing. Ultimately, the law may prove unworkable and unenforceable. 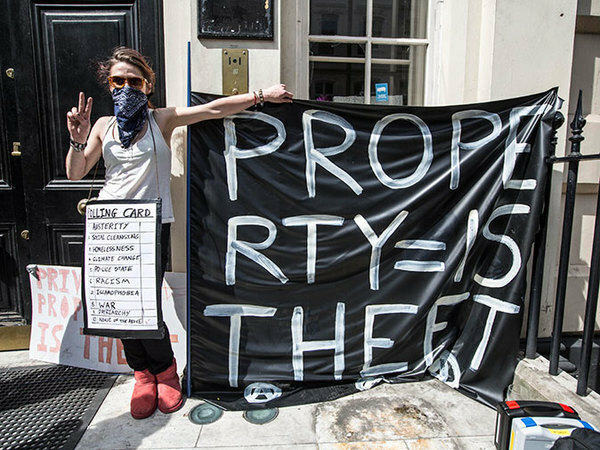 Ten days ago, squatters occupied a residential council property in Southwark in protest at the sell-off of council houses and the criminalisation of squatting under s.144. 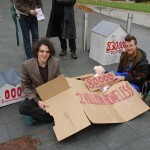 Last week, a Brighton squatter was acquitted on appeal as the prosecution failed to prove he was living at the property. His two co-defendants had previously been acquitted on the same charge. Yesterday, another case collapsed when the Crown Prosecution Service presented no evidence at Mold Crown Court against Tristan Dixon who was appealing his conviction under s.144. 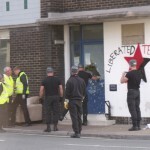 Photos and videos of Canton police station and the eviction resistance. 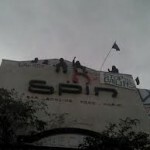 In the early hours of Sunday morning, we entered and occupied Canton Police Station. We did not ask for permission, as it is our legal right to do so. 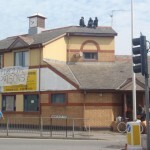 Given Cardiff Police abandoned the building over a year ago, kindly leaving twelve different open windows for us to choose our entrance from, permission seemed a bit of a formality anyway. We’re now meeting monthly and are hosting our first event, a Squatters/Travellers Workshop & Skillshare on Thursday 20th December at 3pm, at the Red & Black Umbrella. This will be an hour discussing the law around squatting, recent changes, and how to still squat legally in commercial buildings and on land. 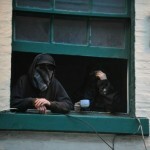 Followed by another hour skill-sharing how to occupy and secure spaces to live in/on. 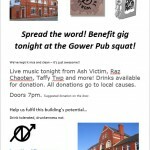 Contact us at cardiffsquatters [at] riseup [dot] net to get involved. 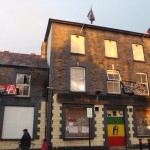 On Tuesday 20th November we made our presence known to Keylet, owners of the Bute Dock Hotel and the largest estate agents (property racketeers) in Cardiff, that we had squatted their pub, on West Bute St, Cardiff Bay. Two people from our welcoming committee of a dozen visited the executive offices at around 10am, located behind our hotel, to inform them of our occupation. Due to the layout of the building(s), which includes an inter-connecting corridor between the offices and hotel, it was effectively explained to them, with title plans and legal notice included. In summary which part of the building they still had possession of, and which part they had recently lost to us. We the Gremlins (currently squatters of Gremlin Alley) will be re-opening our social centre to the community later this week. After a thorough clean up, re-organising our space and lots of hard work, we are pleased to announce that we will be going back to ‘business as usual’. There will additionally be a video communique to be released tomorrow regarding the on going resistance to keep the space. We also now have a social centre phone – 07967 249310 – for anyone to directly communicate with us. To be included in our phone tree for eviction alert, upcoming events and gremlin news, please text us with ‘Add me up’.